Two days straight cold and cloudy here, so again enough time to work and blog, so here is a small photo report with accompanying commentary. 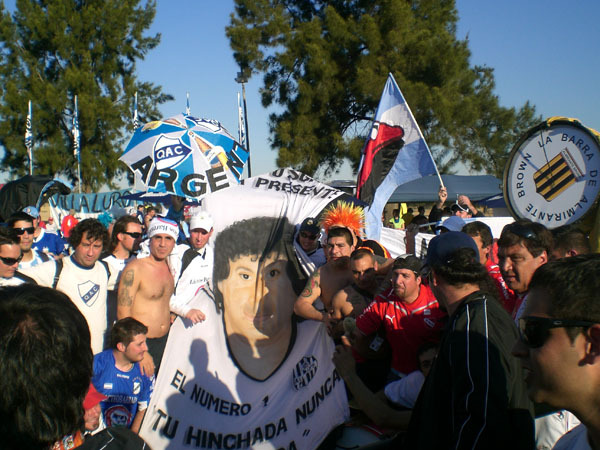 In the pictures you can also see hooligans from other „Hinchadas Unidas“ teams, such as Quilmes, Almirante Brown, and Colon. The Independiente fan in the white shirt comes up to me, and closes the zipper on my jacket, because I am wearing a Racing jersey. Immediately after you hear a second voice, from another Independiente fan, asking „what is he wearing under that?,“ in not the best tone of voice. Seeing the big potential for trouble here, I chose to end the video and discreetly extract myself from the situation. A further negative consequence of the large Independiente hooligan presence here, is that it seems that this has inspired lots of other „regular“ Independiente fans to travel as well, as I sometimes have the impression that Im standing in their terrace rather than a World Cup game. Unpleasant. 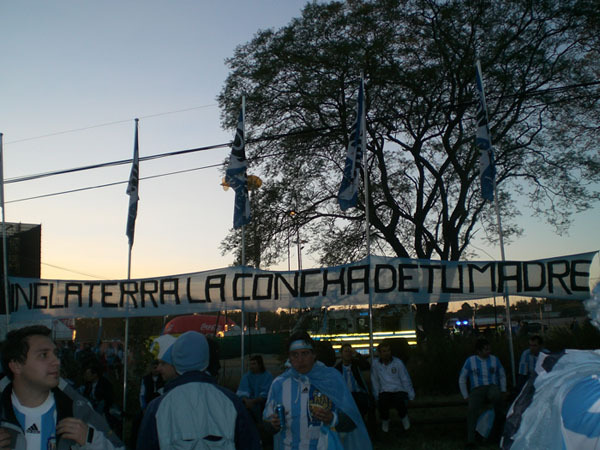 Otherwise we have cordial to good relations with barras and hinchas from a wide mix of other teams, but we all choose to keep a prudent distance from the large groups of „Hinchadas Unidas“ hooligans. here), and this was almost the case at the game against Greece. 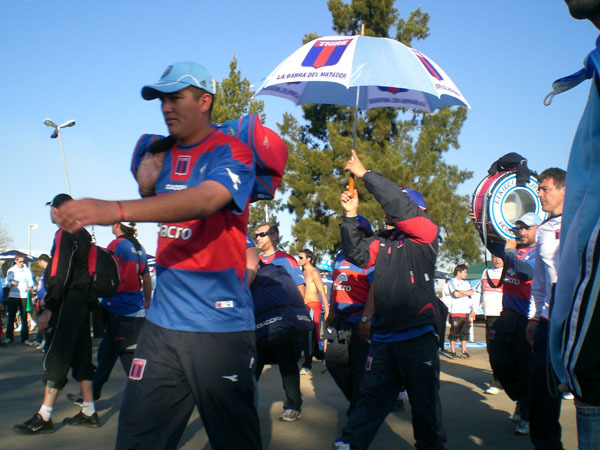 As we were entering the stadium we noticed the San Lorenzo barras just standing around right after the security checkpoint. We asked what they were doing, and the answer couldnt have been clearer: „Were waiting for the Huracan people, were going to kill them.“ We bought hot dogs, placed ourselves at a prudent distance, and waited for the show. Sadly, they didnt come, we got bored, and moved along. Once inside the stadium though we were treated to a show worthy of an action movie. In one corner of the stadium the Huracan fans, and in the middle of the stadium the San Lorenzo fans…and us more or less right in the middle. The gestures and signals they were making back and forth to each other were fascinating and terrifiying, especially considering that they were coming from people who are more than willing and capable of backing up their threats (clashes between the two have already left several people dead in the last few years). „All your banners are at my house, come and get them,“ or „please, please, please wait for us outside…well kill you all,“ were probably the nicest things that were said. 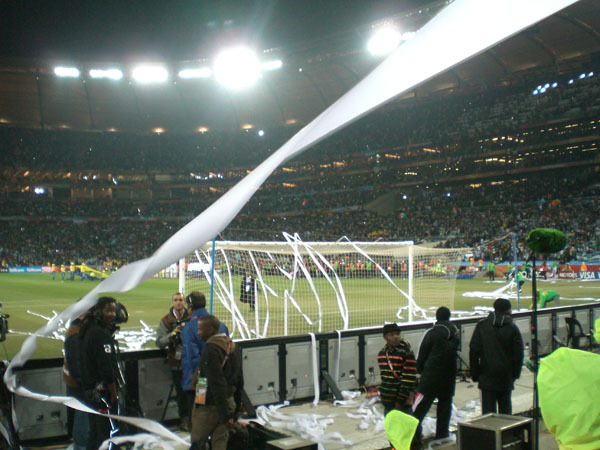 In the end everybody behaved, as is most often the case at the World Cup, because nobody wants to get in trouble and miss it. The worrying part (for us as well, in what refers to our issues with the Independiente and All Boys fans) is what may happen when and if Argentina should be eliminated and there is nothing more to lose. *Team coming onto the field against Mexico. Not nearly the same as in Argentina, but not bad considering the security. 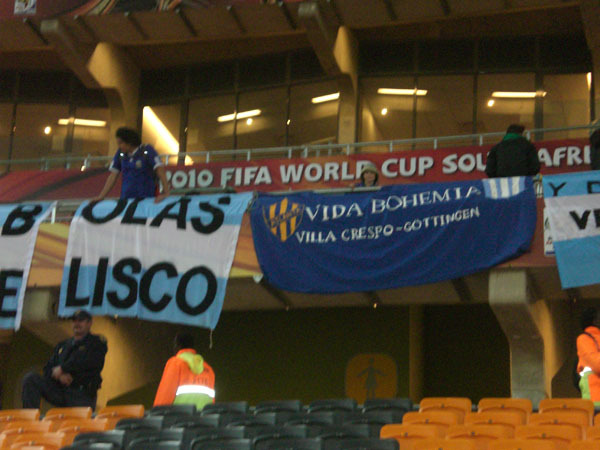 *The glorious „Vida Bohemia“ banner, at its second World Cup. Hanging the banner is a very complicated and frustrating experience, as the idiotic regulations of FIFA coupled with the overzealous South African police mean that we are constantly getting hassled because of the banners being too large, too long, blocking a logo, and so forth. The cops are then very quick to get aggressive with people. The pig who can be seen at the bottom left of this picture, together with three of his friends, even went so far as to *arrest* the person with the banner next to ours for it being too long and him not removing it fast enough. This despite that it was TWO banners, cut in the middle, both making one message. *Which brings us to our next point, encounters with the local fauna. Besides the run ins with hyenas and monkeys which Ive already written about, we have had three separate encounters with the local variety of a species known worldwide for its aggressiveness and general unpleasantness…pigs in uniform. Fortunately, the local variety is similar to that of Argentina, and probably most other poor and underdeveloped countries, and we havent yet encountered a situation which we couldnt resolve either with a friendly contribution to their lunch money, or pity stories of poor South American tourists. Regardless, still not enjoyable experiences, as we have been threatened with exorbitant fines or jail sentences (Ive lost track of how often Ive heard the sentence „we must arrest you now“ in the last few weeks) for driving too fast, exiting Kruger National Park too late (I even really, truly, with a straight face argued that jiraffes and elephants were blocking our way, causing our delay! 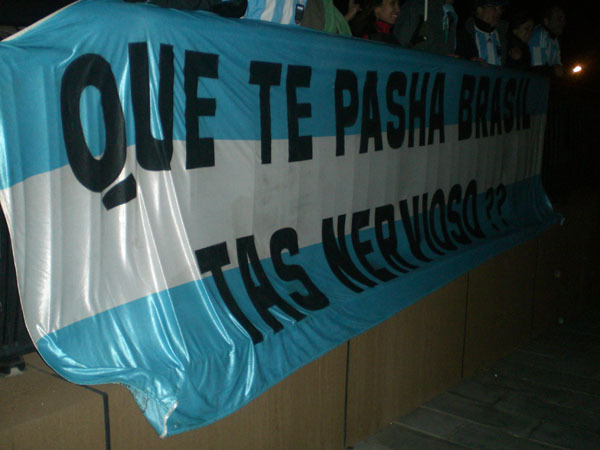 ), drinking alcohol on the street, refusing to sit down, refusing to leave the stadium, and so forth. Du browst gerade in den Fire and Flames Weblog-Archiven nach dem Tag 'futbol'.